Without the sacrifices made to preserve freedom, there could be no independence. And without independence, those sacrifices have no meaning. And so tonight Israel remembers its fallen in the Yom HaZikaron, Memorial Day. 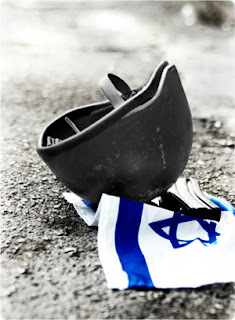 And tomorrow, it remembers their achievement, a free and independent nation in Yom HaAtzmaut, Independence Day. A day after Israel's declaration of independence on May 14, 1948, it was fighting for its survival against local Islamist militias, including the Mufti of Jerusalem's, Jaysh al-Jihad al-Muqaddas, along with the armies of 7 Arab nations, Saudi Arabia, Iraq, Lebanon, Jordan, Egypt, Syria and Yemen. On the Muslim side was the Arab Legion, at the time considered to be the best army in the region, under the British General Glubb, whose son would later convert to Islam, and become involved with terrorist groups. 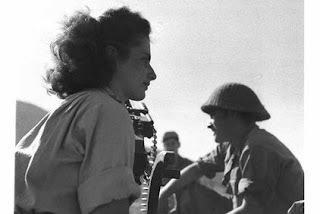 On the Israeli side were frontier units that had evolved not that long ago from orchard guards, ex-WW2 US and UK soldiers, refugees just off the boat who had been given a rifle to hold, with or without ammunition and small groups of farmers holding out as best they could. One such small group of farmers in the Battle of Gesher, held out against several battalions of the Iraqi army, under the Crown Prince of Iraq, Abd Al Illah (Slave of Allah). But today while the sirens sound in the cities of Israel, the electronic wail for the voiceless dead-- the corridors of power under Obama are filled with a relentless scurrying and plotting on how to best convince or compel Israel to surrender its independence. Pundits contribute their op-eds in the Times and the Post, debating the finer points over whether Obama should try to bring down Israel's government or visit to deliver a speech in the Knesset laying out the plan he intends to impose on Israel. On how to make the sacrifices of 1948, as worthless as the sacrifices of 1967. How to carve up Israel into pieces small enough for its old enemies to be able to swallow up whole. During a Memorial Day address at Ammunition Hill, Netanyahu remembered the high price Israel had paid, twice over, for Jerusalem. "One of the critical battles in this campaign took place here. True heroes fell here. They and their friends changed our country's way of life. Twice we have paid a heavy price to relieve the siege on Jerusalem - the first time during the War of Independence, and the second time when the city was bombarded during the Six-Day War. Jerusalem, which was then a withered, divided city, has returned to being a city full of life. Today Jerusalem is under siege for a third time. Not by armies with guns in hand, but by politicians bent on forcing appeasement. The invaders no longer come in uniforms. They come wearing suits and ties, bearing diplomatic papers in hand. The new siege of Jerusalem is a diplomatic siege by men who have never fired guns, but who would rob the sacrifice of those who stood watch against the night. And the conclusion that must be drawn from this third siege is that Israel is neither independent nor free. Not until it can dispatch them home empty handed. Not until it can secure a true and lasting independence by putting its people first and putting the diplomats who slip money to left wing groups to agitate against Israel at home, the retired generals, the successors to General Glubb, trying the terrorist PLO militias in the West Bank, the Bidens and the Clintons and the Obamas, glaring down at a green and verdant land like circling vultures. Israel has withstood sieges of arms. It has paid for it dearly, but it has survived and thrived. But Israel is succumbing to the siege of diplomats, because it is neither independent, nor free. And that is because it has stood up to its enemies in battle, but it has never been able to shake off that inferiority complex that manifests itself in seeking their approval, in believing that the moral high ground comes in making concessions to those who would kill you, rather than in protecting your own citizens against them. This insidious rot flows through the veins of the civilized world. It is a rot that European Jewish immigrants brought with them, a rot that Middle Eastern Jews markedly do not suffer from. And so time and time again, Israel's diplomats have given up at the negotiating table, what its soldiers won so dearly in war. Today Israel has the region's best soldiers and the worst diplomats, who go from door to door, apologizing for their country and trying to defend it halfheartedly against the worst of charges. Meanwhile their enemies, who murder their own children for honor, build cities with slave labor and openly declare that they will destroy every non-Muslim country in the world, laugh at their downfall. And so despite another conservative government in power, Israel is more Chaim Weizmann than Ze'ev Jabotinsky, a state perpetually apologizing for itself, eagerly trying to win the favor of foreign diplomats and politicians, and willing to fight only at a last resort. That last resort came in 1948. It came again in 1967. It came once more in 1973. And it will come again very soon. Russia has declared that Iran will have an operating nuclear reactor by August. That is likely the same time frame within which Obama will attempt to impose a new peace plan, one that will divide Jerusalem a second time. And so Israel will be forced to fight again. The question is whether it will be fighting for its survival or its independence. Israel has spent the last several decades fighting for its survival, and the country is weary of it. Because the difference between fighting for survival and fighting for independence, is the same as a man swimming to cross the channel, and another man trying to stay afloat in open water. The difference is purpose. The amateur men and even women, fighting in 1948, understood what they were fighting for. They were fighting for their freedom. The average Israeli soldier today sees himself as something akin to a police officer, walking a fine line between not getting shot, and not doing something to a potential terrorist that will result in an international incident, and jail time for him, under the IDF's horribly defeatist Rules of Engagement. The IDF soldier swears an oath to protect his homeland, but what land is that. It is not Gaza anymore. Is it Judea and Samaria on the West Bank, and if so which parts of it? Is it Jerusalem or only half of Jerusalem. Is his home in Givat Hayovel part of that homeland he is defending, or will a new government decide that he is actually a settler, and under international pressure, decide to demolish his home and drive out his family, even after he has died a hero's death? He does not know what his land is, because his land is now whatever the international community will decide it is. He does not even know what it is he's fighting for. Is it to fight terrorism? He is rarely if ever allowed to do this. Is it to protect his country? But who is he protecting it from, when the terrorists who are trying to kill him, were imported into the country as part of Arafat's police forces in the Peace Process-- by his own government and the Clinton Administration. And so the IDF soldier of today may be better armed, better trained and better equipped, but he is actually inferior to the volunteers who fought against better armed and trained Arab armies in 1948. He is inferior because he does not know anymore what is he fighting for. He is trying to stay afloat in open water. 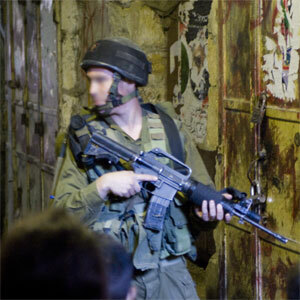 To avoid being involved in a shooting incident will be result in an outcry against Israel. To stand guard, without offending anyone. To fight for land that his government has already sold out from under him. And so he will fight again. Even if he is no longer sure what he is fighting for. He stands in the shadow of the legacy of those who fell in defence of Israel's independence. But over him is the far greater shadow of Sinai and Oslo and Annapolis and the Quartet, of Kikar Rabin and leftist protesters who scream at him that he is an oppressor and a monster every time he stops an Arab Muslim at a checkpoint. And it is this shadow of appeasement that must be lifted from him if Israel is to survive. When the Israeli soldier fights again, he must know what he is fighting for. Not survival. Not a chance for the diplomats to sit around the negotiating table again, and take apart the map of Israel like spiteful children playing with a puzzle-- but for independence. His country's and his own. Israel must have a true and lasting independence if it is to survive. It must have it, or it will perish and die. The graves of the dead open on Memorial Day, and those who died peer out, to know if their sacrifice was of any worth. In Jerusalem and beyond, in unmarked graves, buried among the rubble, lost in the land of the enemy. Once, the Prophet Ezekiel stood in the valley of dry bones, and G-d asked him, "Son of man, can these bones live". In 1948 the House of Israel was a house of dry bones. Starving concentration camp survivors, children hiding in forests with haunted eyes, a handful of militia playing soldier with used Czech rifles. Jews living as degraded and oppressed servants in a dozen Muslim nations. Turning the dung of camels into fuel. Knowing that they had no rights, but the right to bow to their Muslim betters. And so He did. They came on boats through the British blockade. Men with stick thin arms marked with permanent numbers took up rifles. Dry bones that somehow stood and fought. Men who had been compelled to walk behind Muslims, to bow to Muslims, to defer to them-- took up arms and fought back against them. And they lived. Even those who died, lived. And will live forever. What is the difference between dry bones and the living. It is spirit. Without spirit, a man may walk and talk, but he is already dead. The State of Israel today has tanks and submarines, jet planes and nuclear reactors. But its spirit is being leeched away. Its people are again oppressed. Once more their old masters rule over them. For Israel to live again, it must secure a true and lasting independence. It must fight for it. It must give up the idea that anyone but its own people and its own G-d may sit in judgment over it or dictate its borders. For only through independence, can Israel ever be free. Israel needs to throw out the idols and the idolators who we have allowed inside. We are to dwell alone, not allow the nations to live with us. Throw the bums out and turn to G-d.
Daniel, excellent writing here. If only we could change words to actions. By the time we are all fed up, this time it will be too late. Excellent post. I have taken the liberty to reprint it on my blog, since as I noted, you did a better job than I would have done. It's been fully attributed to you, but if any objections, please let me know, and I will remove it. "It is a rot that European Jewish immigrants brought with them, a rot that Middle Eastern Jews markedly do not suffer from." What do you suppose is the root cause of this? I only can hope and pray that our "leaders" will get it before it is too late. We must somehow grasp, digest, and act upon what it means to be a Jewish Nation. Ben Gurion hoped for the impossible......we can never be both a light unto nations, as well as a nation like all others. We'd better choose quickly, and unfortunately I won't be holding my breath. I live in a Kibbutz in the Eshkol region. For years I have been watching as my fellow countrymen have been loosing their sense of purpose and identity. In order to survive what is obviously coming we must reestablish and redefine that identity. But this is not only for us in Israel but for all the Jews still in the diaspora. Truly it is 1939 all over again and the writing is on the wall. Late last night I was watching a docu-drama on the the life of Hannah Senesh. Truly amazing and inspiring (though very tragic ending)information on Israeli history. 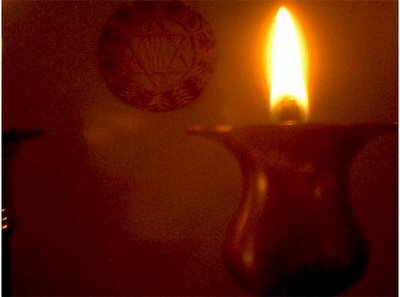 "Blessed is the match consumed in kindling flame. Blessed is the heart with strength to stop its beating for honor's sake. Blessed is the match consumed in kindling flame." Toward the end of the show, when Hannah was in prison, the narrator says that she didn't feel the need to march in the prison yard wearing a yellow star because she was no longer of Hungarian, but an Israeli (Citizen of Palestine, they said). same thing as in the rest of the civilized world. Political correctness is the disease of a decaying culture that no longer believes in itself.